President and chairman of the César Chávez Foundation, Paul F. Chávez, the sixth of eight children César and Helen Chávez had together during their 45-year marriage, always knew growing up the importance of the work his father was doing for labor unions and farmworkers. 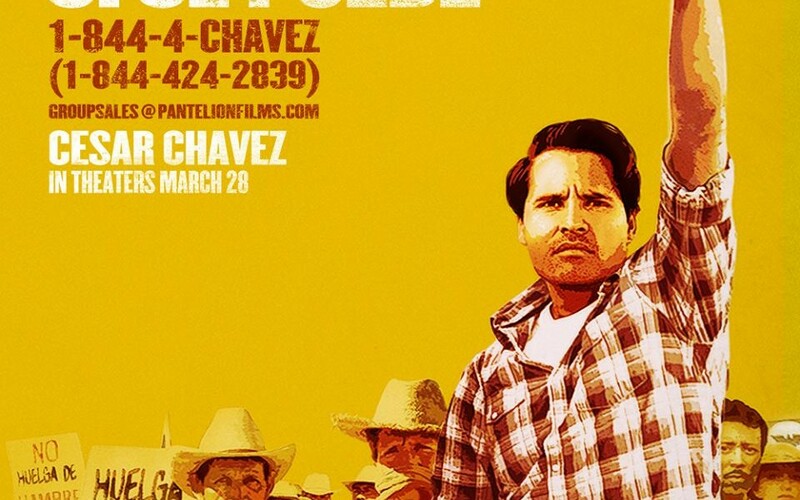 With “César Chávez,” the first feature film ever made about his father, Paul Chávez is looking forward to sharing his family’s history and passing on the legacy of a man he has always placed on a pedestal. During an interview with Gozamos about the new film, which made its North American debut at the SXSW Film Festival, Paul Chávez discussed the reason he felt a feature film on his father was needed, what impressed him most about director Diego Luna and some of the challenges that came up during the pre-production of the film. There has been so much written about your dad over the years and some really good documentaries made about the movement. Why did you feel a feature film was the next step? It’s the medium. Yeah, there have been documentaries, but this is the first big movie for the big screen. We have the opportunity to introduce my father’s life and his work to whole new generations of people who may know the name but may not know what was behind that name. I think the power of a major motion picture really allows you to go in and use popular culture as a way to tell a story. I know the family had turned down other directors and ideas before. What was it about director Diego Luna that made you feel comfortable in giving him this story to tell? We had worked with some different folks who knew my dad and worked with him and marched with him. We tried to put a movie together, but the screenplay was never strong enough or there wasn’t enough financing. About four years ago, we met a gentleman named Keir Pearson (“César Chávez” screenwriter) who wrote “Hotel Rwanda.” It was a very powerful story that captured, not just the epic events of the genocide in Rwanda, but it also put a human face on it. The film was very effective. It was a really artfully crafted story. We were told the strength of the [“César Chávez”] screenplay would determine whether we go to the big screen or if we’re a made-for-TV movie. When we sat down with Keir, we were mindful [the script] was the most important part. It was Keir that brought in Diego Luna and his team to actually put it together as the producers. This only being Diego’s second film as a director, were there any concerns? When we met Diego, sure, there were some concerns. We had seen his work before as an actor and liked it. Some of the concerns we had were that he was a Mexicano from Mexico City who didn’t know the struggle, so how would he portray it? It would be different than someone like [director] Luis Valdez (“La Bamba”) or Eddie Olmos (“American Me”), who was born here and Chicano. When we had our first meeting with him, we were all anxious to see how things were going to pan out. One of the things that impressed us was that he came in not telling us what he was going to do. He came in and said, “What do you think?” He asked questions. He didn’t even get into talking about the movie. All he did was ask questions about who my father was. After talking to him and getting a sense of his sincerity, we all felt like he was somebody we could work with. What Diego has done in [“César Chávez”] is portray my father as more than just a farmworker. He portrays him as a great American hero. Now that you’ve seen the film, is there anything you wished they could’ve left in that they probably had to edit out because of time constraints? Probably the biggest thing is the people who are not developed in the script. They explained to us that you can’t really develop more than four or five characters because then it gets too hard to follow. The fact is, there were hundreds of people involved in key roles in this movement whose story isn’t told. I feel bad because we really do need to honor them, but I also understand that when you tell these kinds of stories, you only have so much time. The big issue we had to figure out from the very beginning was what time frame this movie was going to cover. Was it something that was going to start with him in Arizona when his family loses the farm and comes to California? Was it going to show him growing up as teenager, a pachuco, and going into the Navy? Was it going to show his early days in the Union? My father’s career lasted from the 40s to the early 90s. Everyone agreed pretty quickly that the pivotal point of his life, the period that really established him as a national figure, was that first Delano grape strike. That’s when the issues were the most vividly defined. The movie ends in the 70s, but the fact is my dad struggled for nearly another quarter-century of his life fighting for farmworker rights. What about coming to a decision about which actor would portray your father? That must have been another big decision, too. What led everyone to Michael Peña? That was one of the first questions we asked Diego. Who might be somebody you would consider to cast as my dad? He sat there and threw out a couple of names, and we listened. We had a pretty healthy discussion about what this person should look like. It was important to us that the person who portrayed my father looked like him. I think a big part of my father’s legacy is that he looked like you and me. He wasn’t a big guy. He wasn’t 6’2. He wasn’t blonde. He wasn’t muscular. He was just a working man. We wanted somebody dark and somebody with Indian features that wasn’t a big man that had small hands and spoke softly. When they brought in Michael Peña, we had seen some of his work. We knew this was the actor who should play my dad. The resemblance is there, and the skill, of course, but more than anything, people could get a feel of my father’s essence. We were very pleased with the selection. Being the sixth child out of eight, how do you feel the film captures the idea that you’re father, at times, was absent from your life? Do you remember him not being there as you grew up? Yeah, we grew up knowing we had to share my dad with everybody else. By the time I grew up, my father was a national figure. That’s how we lived. We were more prepared for it than my older brothers and sisters. The film focuses on my older brother Fernando and my dad. Fernando was about 12 or 13 at the time. Being a young teen presents a whole slew of problems in and of itself. So, to have to move to a whole new place and have your father doing work that was considered controversial and have him not there and have to be the man of the house, that is a lot to place on a young man. That’s the point of your life when you’re looking for that affirmation and attention from your father. So, I think they captured that conflict pretty well. We grew up not having my dad at our baseball games. There were many birthdays we had where he was on the road. But he had this way to ensure his work included us. While he didn’t go to our baseball games, we’d go to marches and picket lines. If he wasn’t there for our birthdays, we were there with him for the union conventions and meetings. He also had this knack of knowing when we needed him. When he gave you his attention, he gave you everything he had. For those precious moments, you were the only thing in the world that mattered.